What do you know about Ground Hog Day, a bizarre holiday celebrated in the U.S. and Canada? Ground Hog Day facts and Ground Hog Day trivia! 1. On what day is Groundhog Day recognized in the United States and Canada? 2. According to the custom, what happens if it's sunny on Groundhog Day and the groundhog sees its shadow? 3. According to the custom, what happens if it's cloudy on Groundhog Day and the groundhog does not see its shadow? 4. The largest Groundhog Day celebration is held in Punxsutawney. In what state is located? 5. What is the name of the famous Punxsutawney groundhog? 6. Groundhog Day proponents state that the rodents' forecasts are accurate 75% to 90% of the time. However, scientific data shows that the groundhog is accurate only about what percent? 7. What Texas university has taken Groundhog Day as its official university holiday and organizes a large-scale celebration every year in honor of the Groundhog? 8. 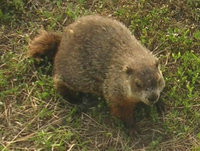 In what state is February 2 observed as Marmot Day rather than Groundhog Day because few groundhogs live there? 9. In certain Groundhog Day events the Pennsylvania German dialect is the only language spoken, and those who speak English pay a penalty. What is the penalty? D. put coins, calculated per word spoken, into a bowl in the center of the table. 10. What actor plays Phil Connors in the 1993 comedy movie Groundhog Day?